Proudly serving the City of Ukiah since 2007. To start residential service, please call 707-463-6228. We offer curbside garbage, recycling and organics waste collection within the incorporated city limits of Ukiah, CA. Residential customers are billed quarterly by the City of Ukiah. To start service, residential customers must go to the City of Ukiah office located at 300 Seminary Avenue. The office is open 7:30 a.m. to 5:00 p.m., Monday through Friday. A valid picture I.D. and copy of your title or lease agreement is required. 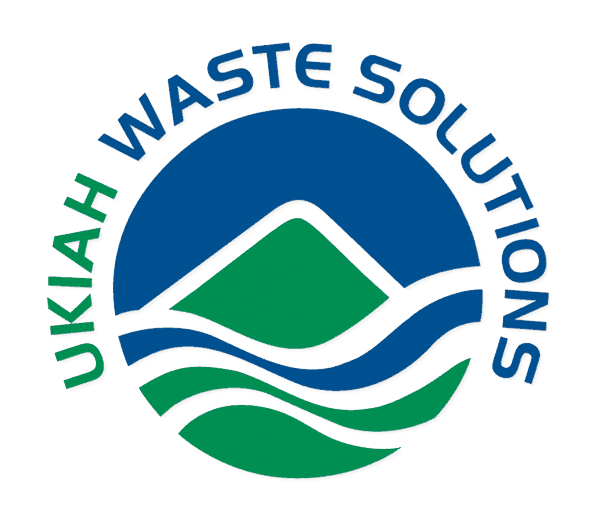 Once service has been started, customers should call Ukiah Waste Solutions at 707-234-6400 for service-related issues and questions. To start service, residential customers must go to the City of Ukiah office located at 300 Seminary Avenue. The office is open 7:30 a.m. to 5:00 p.m., Monday through Friday. A valid picture I.D. and copy of your title or lease agreement is required. Once service has been started, customers should call Ukiah Waste Solutions at 707-234-6400 for service related issues and questions. Customers may choose to have route collectors walk-in their driveway or backyard instead of rolling carts to the curb or roadway edge. A fee for this service is charged. Please call 707-234-6400 to make arrangements. We offer onsite garbage, recycling and organics waste collection within the incorporated city limits of Ukiah, CA. Commercial customers are billed monthly. To start service, commercial customers should call 707-234-6400 to initiate service or visit us at 3515 Taylor Drive in Ukiah. Material: Food scraps, green waste, landscape and pruning waste, non-hazardous food waste and paper waste that has been soiled with food. California Assembly Bill (AB) 1826 requires most businesses – including multifamily dwellings to recycle their organic waste. What does this mean to your business or apartment complex? If you generate 4 or more cubic yards of solid waste per week, or have 5 or more units at a multifamily dwelling, you must have organics waste recycling service (effective 01/01/19). Depending on how much waste your commercial business generates, organics waste recycling is mandatory. At Ukiah Waste Solutions, we are committed to ensuring your compliance with AB 1826. Please contact us at 707-234-6400 for a free onsite waste assessment or to schedule service. At UWS, we are committed to being your local recycling resource. An on-site assessment of your waste stream can identify ways to capture more recycling which may result in a reduction of your garbage bill. Please call us at 707-234-6400 to schedule a free on-site visit. For those temporary special projects or large jobs, UWS provides the right bin at the right price for the right material. Weight restrictions are enforced and a signed agreement is required. Please call us at 707-234-6400 or complete a Request for Services form for more information. Hazardous Waste and Universal Waste is strictly prohibited in all garbage carts, recycle carts, green waste carts or debris boxes. This includes all paints, thinners, pesticides, motor oil, fluorescent tubes and electronics such as televisions, monitors, and VCRs. Please contact the Mendo Recycles at (707) 468-9704 or visit them at www.mendorecycle.org for information on locations and schedules for Hazardous Waste disposal. UWS is committed to educating residents and providing value tips regarding garbage, recycling and composting. Want to catch up on all of our Ukiah news? Browse through our recent news.